In today's high-tech world, feature phones are a dying breed, but Microsoft still hasn't given up on such products. The fact is that they are still essential for a lot of developing markets and novice or non tech-savvy users. Consequently, feature phones are still quite popular and tend to move in big volumes if they are priced and marketed right. Microsoft seems to have all of these bases covered with the new Nokia 105. It takes after its namesake predecessor, which, by the company's own account, has been selling about 100 units per minute since 2013. So, there is definitely some revenue to be made even at budget-friendly price points, like the $20 the Nokia 105 should go for. The price definitely makes the small device quite universally affordable, but Microsoft has also put in quite a few improvements over the previous generation. The new rounded design is a lot more-comfortable and with a color choice of black, white and cyan, the phone can be unobtrusive, or colorful and vibrant. Whichever is to your liking. The Nokia 105 also boats space for up to 2,000 contacts, which should be plenty for almost anybody. Battery live is also quite impressive. The small, replaceable 800mAh battery can pump out enough juice for up to 15 hours of talk time and 35 days standby. The Nokia 105 also comes in a Dual-SIM variant, for even greater flexibility. You can't really expect much from a 1.45-inch LCD screen and a Series 30 platform, which is quite limiting as far as functionality goes. 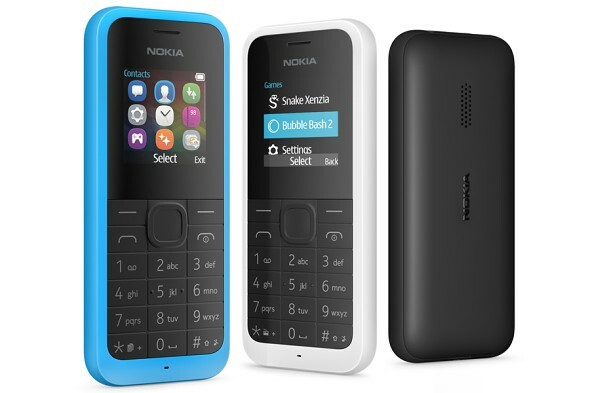 However, if you are willing to spend a little more, Nokia recently unveiled another similar device - the Nokia 215, which brings a lot more advanced functionality and puts social networking on the table.